Trains from the Deutsche Bahn run several times a day to Passau mainstation, from where the walking distance to the centre is only about 18 minutes. Take the highway A3 towards Passau and use the exit 116 - Passau Mitte, follow the B12 towards Fürstenzell/Engelhartszell/Donau. From there use the B8 about the driveway Engel-Hartszelle/Österreich/Passau Zentrum. The nearest airport from Passau is Linz, Hörsching, in Austria, only one hour and 10 minutes away from Passau. Because Passau borders Austria, the airport is nearer than german airports. Otherwise Salzburg is also very close, only one hour and 50 minutes away from Passau. The "City of Three Rivers", wonderful architecture, plenty of of nature places, museums and galleries of art, music, literature, theatre and cabaret. Fascinating for young and old! Passau is crossed by the three rivers Donau, Inn and Ilz, which gives the city the name 'City of Three Rivers'. Thanks to Italian architects the city has a nice southern flair, which is impressiv and fascinating. The city has a variety watchable old and interesting buildings, famous tourist attractions. The location at the confluence of several major rivers always causes extreme floods. Comprehensive and versatile, the range offers sporty and of available sports facilities. The same applies to the recreational facilities in the city and region, which are geared to the needs of each individual. The offerings of museums and galleries, the care of music and literature, theater and cabaret inspire locals and visitors. Passau is a wonderful city and offers many attractions for adults and children. The city is located at the border of Germany and offers that's why the opportunity to make a sightseeing trip outside Germany and explore foreign surroundings. Passau is a wonderful city in Bavaria with many special offers and different places of nature or special activities for everyone. Passau offers the opportunity to make river cruises on the rivers Donau, Inn and Ilz. Such a cruise offers the chance to enjoy the view and to learn something about the fascinating historical city Passau. Very relaxing and interesting and the side effect is a sightseeing tour through the city in the fresh air. Because of the three rivers Passau is surrounded by, the city offers a lot of nature to explore. The rivers border on parks visitors have the chance to take a walk at. The city is full of wonderful nature parks and places and perfect to explore. Fascinating and interesting for all nature lovers and walking fans. 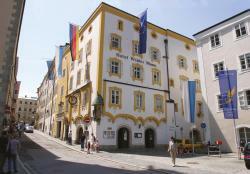 The city Passau offers many different kind of museums and exhibitions for adults and children. Among other things, they are about art, architecture, nature and paintings, for example the 'Ambulante Galerie', which deals with art. Very interesting and worth seeing for everyone. Recommendable for museum - lovers and not only for a special age segment, made for everyone. Located in the same building as the Glass Museum, this historic hotel in Passau offers rooms with free Wi-Fi and a grand breakfast room overlooking the Dom St. Stephan Cathedral. The 4-star Hotel Residenz is situated on the banks of the River Danube, in the heart of the Old Town of Passau. St. Stephan’s Cathedral and the historic Residenzplatz square are 100 metres away. This 4-star hotel in Passau's old quarter is situated on the banks of the River Danube, in the immediate vicinity of the city's boat jetties and scenic bicycle route. It offers free Wi-Fi and spa facilities.